I’m lucky enough to have recently returned from a trip to Switzerland. We were mostly hiking the Alps, but I made sure to make some time to buy Swiss candies, including lots of chocolate. The chocolate had a prettily artisanal look about it, with a little cellophane windowpane through which to view the bar. 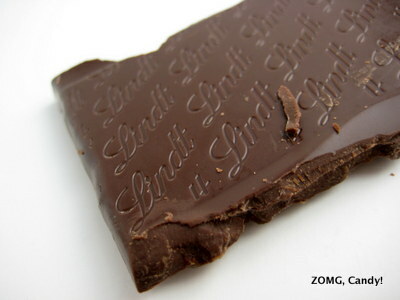 The top side was generously sprinkled with caramel and fat grains of sea salt, while the bottom was imprinted with the scripted Lindt logo. 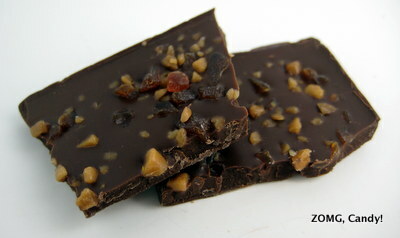 The dark chocolate was creamy with a smooth and thick melt. It had a nice cocoa depth with a slight fruitiness that was highlighted by the occasional flash of salt. 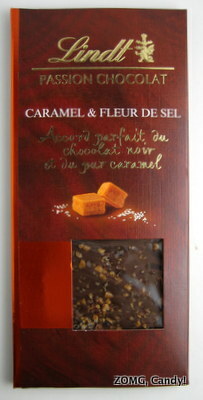 The caramel bits were plentiful and brought a nice, clean crunchiness to the texture of the bar. They tasted sweet, with buttery toffee flavors that took on a slight toasted scorchiness as they melted away. I found this to be a well-balanced treat that was surprisingly well-made for a mass-produced bar. An OMG.